Vatha kuzhambu is easy to make and is really delicious. An interesting thing here is we are making it in mud pot (Man paanai). Click here to read benefits of cooking in mudpot. This vetha kuzhambu will stay fresh for 2-3 days if refrigerated. It pairs well with curd rice too. I prefer eating this vetha kuzhambu with Sutta appalam (papad) sadam. You might be wondering what is Sutta applam sadam, You need to show the appalam (papad) on direct flame to cook (no need to fry in oil). Then break appalam into small pieces and add them to hot ghee rice and mix well. Sutta applam sadam is ready. Excellent side dish for this rice is this vetha kuzhambu. 1) Soak tamarind in hot water for 15 mins and make it a thick paste. 2) Add oil to mud pot and heat it. 3) Add mustard seeds and let it splutter. 4) Add hing(asafoetida), bengal gram and saute for few secs, then add toor and urad dal and sauté till they become light brown in colour. 5) Add fenugreek seeds, curry leaves,red chillies and onion and saute them for few secs. Onions needs to turn light brown in colour. 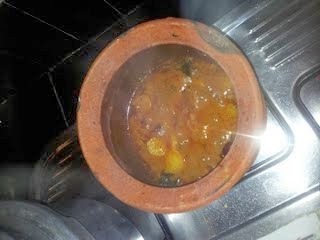 6) add, the tamarid paste, sambar powder and jaggery. 7) Let them boil for few mins in low flame. 8) Once the oil leaves the surface and comes separately, kuzhambu is ready.